When we last left the basement, we had laid the DRIcore subfloor and installed the SMARTWALL wall finishing system. Then we ran into spring, and had to move our work outside. So what was left on our basement list? Get some paint on the walls, and some flooring on the floors. Then we could move to the pretty finishing touches! So let’s talk basement flooring. 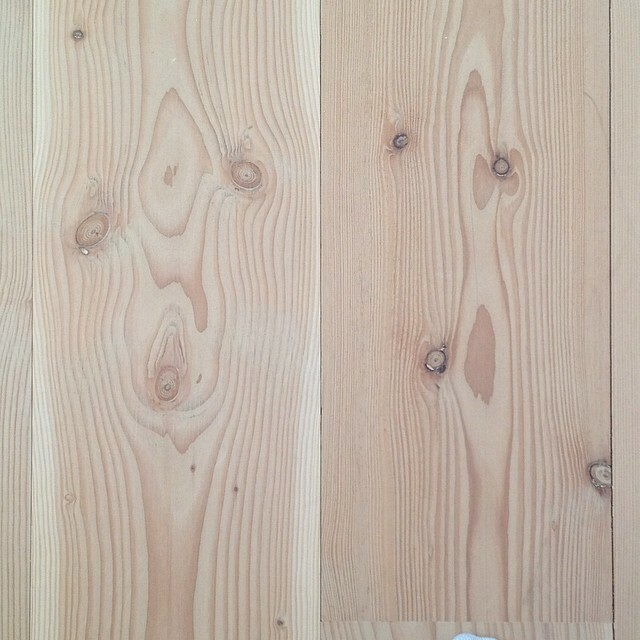 I was inspired by white soaped floors while in Denmark. I even wrote a post on them. I had grandiose plans to do inexpensive soaped floors. 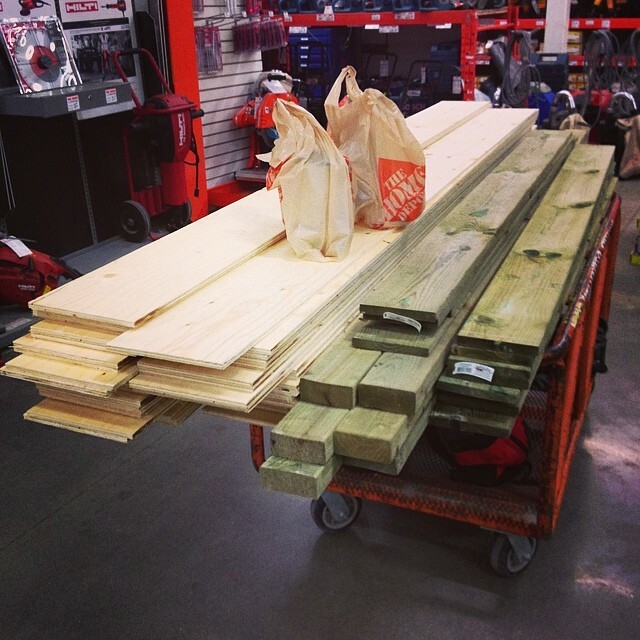 We even purchased a whole bunch of 3/8″ thick standard spruce plywood and had them cut into 7 3/4″ x 8′ planks on Home Depot’s panel saw (much easier than ripping it at home on our table saw). So how do I plan on getting it? A few weeks ago I sanded and sanded and sanded a piece of the plywood, and applied some test stains. I tried Weathered Oak, Grey, and White Wash Pickling Stain. There was one clear winner. 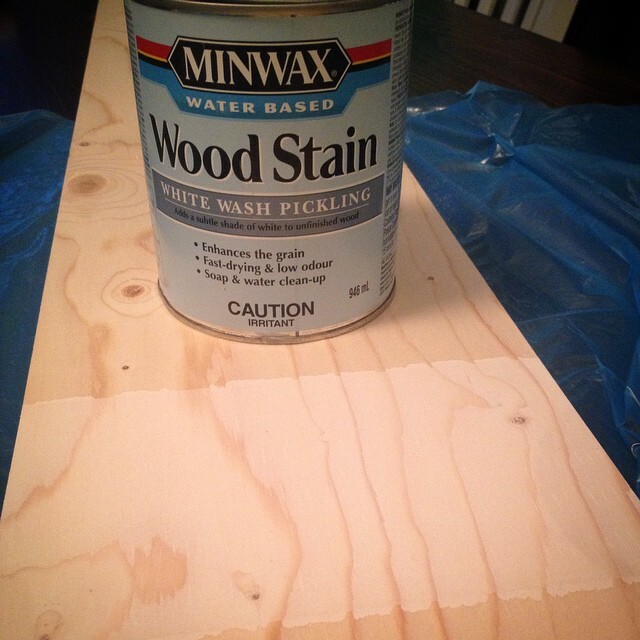 The Minwax White Wash Picking stain. Along with the stain we plan on using Minwax water based pre-stain conditioner and Minwax Ultimate Floor finish in satin. That floor finish is a big one, as it has a non-yellowing formula. White washing floors only to have them amber when the poly is applied would be devastating. 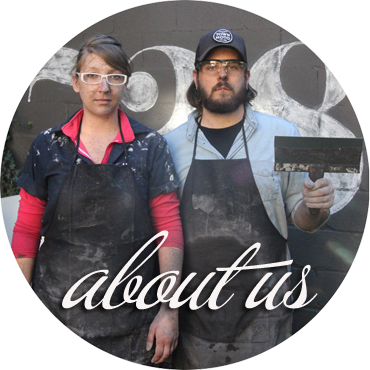 We have the finishing materials ordered, and they should arrive shortly. Now to deal with the sanding issue. We could lay the whole floor, then rent a floor sander and go at the whole thing. Problem is, we could easily sand through the first layer of plywood with the big sander thus ruining the floor. 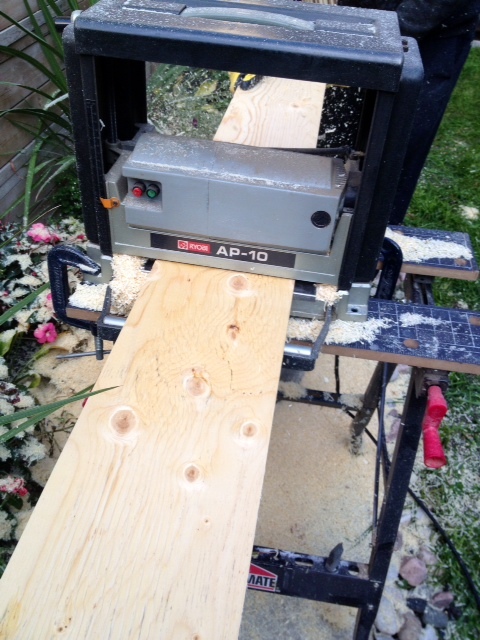 Next idea… use a belt sander and orbital to sand each board before laying. Okay idea, but still very very time consuming. Third idea: rent, beg, borrow or steal a planer and gently shave off a tiny bit of the boards. While a planer may be on my Christmas list (please Santa please!) Such an expensive tool could not be justified for this project. Enter the begging and borrowing. When we got our new Milwaukee sliding compound miter saw, we gave our old 10″ slider to my Dad. 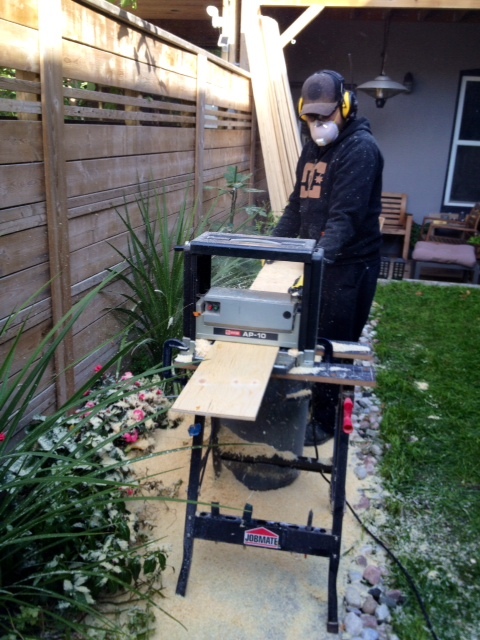 He was building a deck, and his saw wouldn’t handle 6″ wide boards. So I causally mentioned the gifted saw, smiled a sheepish good daughter smile, and asked to borrow his planer. He said yes! His beast of a planer (this thing is solid metal and must weigh 100lbs) came home with us at Thanksgiving. Thanks Dad! 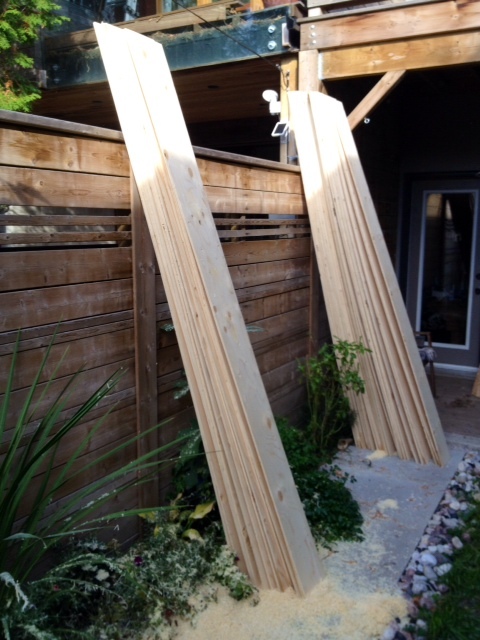 This weekend we spent an afternoon planing those boards into perfect planks. 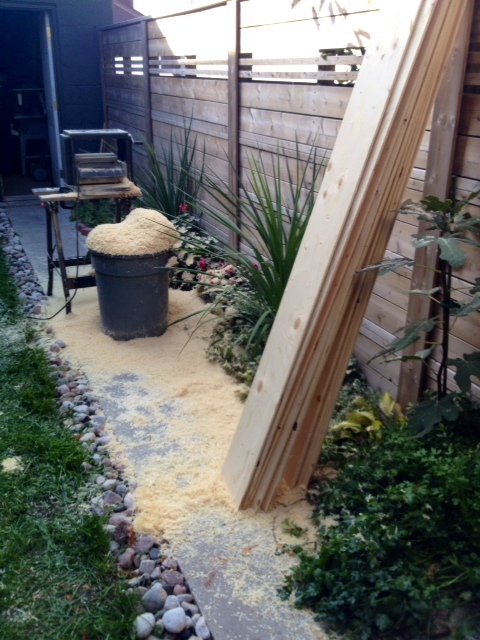 It was a noisy, sawdust filled endeavor, but with utterly fantastic results! We did run into a few issues with the knots tearing out in the planer. We will strategically cut out the bad parts when we lay the floor, and then wood fill and sand the others before staining. We got all the flooring planed, and it is stacked back in the basement ready to be laid. I would like to get the basement wall painted before laying the floor. Is it wishful thinking that I could paint it after work one day this week? Hahaha yeah. Fabulous! I just discovered the Minwax Whitewash Pickling stain too! I'm over the moon about it. We have similar plans for our basement floor. Can't wait to see how yours turn out :) And that planer - man oh man! Awesome sauce! Very cool that it turned out so nice. I'm looking forward to seeing it all in place. It's such a great look, and one that we liked a lot when we saw it in Copenhagen. Those Scandinavians have some pretty great simple taste, right? I'm keeping my fingers crossed that Santa hears your planer wishes. I don't use ours often, but when I need it, it's awesome. Wow! The boards look AMAZING! Score one for Dad for lending you that planer. :) Kes and I debated doing ply planks for our upstairs floors, but I talked him out of it after I realized how much work it would be on top of everything else we have on the list to get the house complete. I'm really excited to see how yours turn out. The stain is gonna look so so good. It's a lot of work for sure! 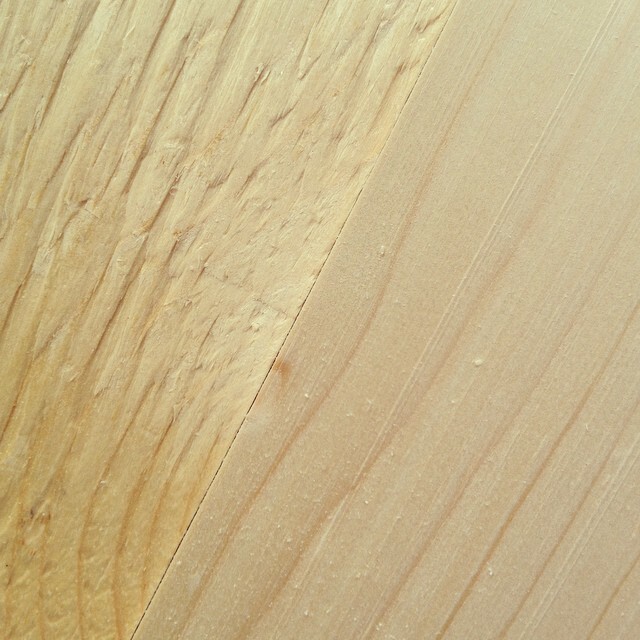 You can save some work by buying nicer grade plywood, but that can eliminate the cost savings of going plywood at all. I was in a home over thanksgiving that had beautiful wide plank douglas fir flooring that had been treated in lye. It was gooooooorgeous, but omg expensive. Im excited to see yours!! SOOOO expensive. Like, better be my forever home before I invest in it, expensive!